Here are some more springy layouts. Once again, flowers, butterflies and cheerful colors are on the menu. I have been inspired by some of the layouts that I have been seeing that use larger circular photos. When Walgreens was giving a free 8X10 a couple weeks back, I ordered some and just love the look of them on a layout. I hand cut some flowers from the Basic Grey June Bug paper and used a 6 petal flower punch to create the 3-D roses. The "I Love You" is a rub-on that I have had in my stash for a couple of years. I was surprised that it still worked! Notice the cool decorative white border? I just got this idea from another blog, and it was a cinch to make. Draw the design that you want (circle, square, artist's bracket, etc.) on the back of your paper. Use your hole punch (I used my Crop-O-Dile) to punch along the lines. Then cut along the line. Easy! I do see some more of this in my scrapping future. I just love the way that this Sassafras Lass paper looks with the photos - so happy and bright...so Sam! Patterned Papers (Sassafras Lass, Basic Grey, October Afternoon, K&Co, Little Shoebox), K&Co chipboard, Robin's Nest dew drops. I've got spring ever. I can't help it, but every layout I create screams for a cluster of flowers and at least one butterfly. These pictures were taken on Easter. 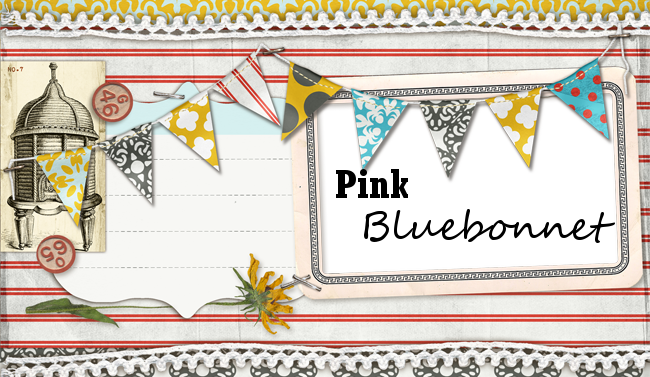 I wanted to pull from the bright and cheerful colors from the pinata on this layout. I'll also take any excuse to incorporate pinks and purples, too! The green butterfly is from Michael's. I found a box of beautiful butterflies in the "non scrapping" aisle and thought that they would be pretty embellishments on some of my pages. I applied a coat of Stickles to some chipboard letters for the title. I embroidered a circle around the picture of Jack. I didn't want him to get "lost" in all of the pictures since it was his first time to hit the pinata and eat candy. He had too much fun! My first bluebonnet picture for bluebonnet season...more to come! Gabrielle Pollaco has a great tutorial on her blog for creating these twisted fabric blooms. I have a lot of fabric scraps that now have a purpose for their existence. 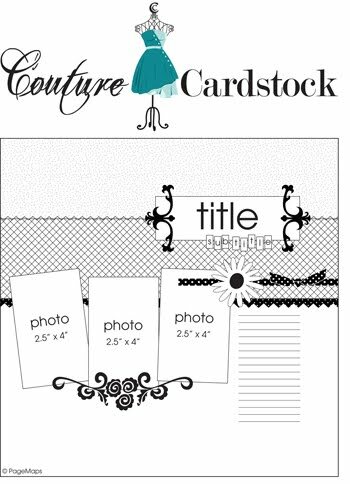 I created this layout for a Pagemaps "Couture Cardstock" challenge. For the challenge, I had to use this sketch by Becky Fleck, and the theme was wide open. 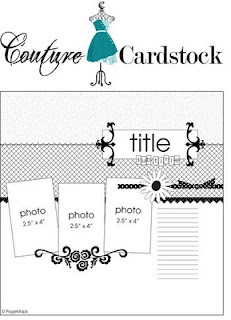 The winner will receive 50 sheets of cardstock from Couture Cardstock. There's still time to enter! I also used the packaging from the Prima felt stems behind the photos. I hope that everyone had a happy Easter. We spent the day with family, and we got a lot of good pictures that I can't wait to scrap. Today I am posting the layouts that did not get picked up for publication. I submitted this layout for the theme of hopes/dreams and faith. I absolutely adore these Amy Butler papers. I am addicted to making my own roses now. I use this great tutorial for making roses out of a 6 petal punch. They are easy and fun to make. Here is the link for the tutorial. Samuel was pretty frightened by the rain. I nipped that fear in the bud by letting him dance in it. He had tons of fun and is no longer afraid. I'll admit, I was slightly relieved to learn that this was not one of the layouts picked up for publication. It's just not one of my favorites. I do love the pictures though! Who would succumb to the pressure and buy a 3 year old a lasso? Certainly not me! Stars, flowers, circles, and lace...lots going on for this patriotic layout. I don't believe in luck, but I do believe that I am blessed. I also found a way to use one of my Jenni Bowlin BINGO cards. :) I got out my sewing machine for this one!